Tension gripped the township this afternoon after scores of agitated family members and supporters of Roshni Devi, the councillor who died yesterday at a superspeciality hospital in Mohali, today blocked traffic in the town for more than three hours. A civil surgeon, who is also the chief medical officer, and a clerk of the Civil Hospital here have been booked by the local police in connection with the death of a fourth-class employee yesterday. The issue concerning the release of land belonging to “influential persons” from the land acquisition process for the development of two sectors in Kurukshetra district was resolved today after Haryana’s Advocate-General told the Punjab and Haryana High Court that the state government had decided against going ahead with the process. Residents of Rohtak, which happens to be the hometown of Haryana Chief Minister Bhupinder Singh Hooda, have been facing an acute shortage of drinking water as well as electricity for several days. A 20-year-old wife of a multinational banker in Gurgaon allegedly committed suicide yesterday by hanging herself from the ceiling fan after being physically and mentally harassed by her husband and in-laws. The district consumer redressal forum here has directed a pesticide company and its dealer to pay Rs 1 lakh as compensation to a farmer after holding it guilty of supplying him substandard weedicide. The mortal remains of Sandeep Yadav (24), a jawan of the 21 Rashtriya Rifles, were consigned to the flames with military and state honours in his native village Dahina, 24 km from here, today. Rewari zila parishad chief Satish Yadav, SDM Y.C. Bhardwaj were among those who placed wreaths on the pyre. His cremation was largely attended. The invasion of mealybugs insect in the cotton belt has become the cause of concern for farmers here. 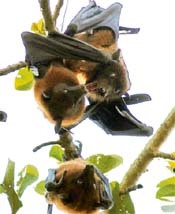 The farmers resort to additional spray of pesticides to kill the insect. A large number of farmers today blocked the national highway for more than one hour protesting against the non-procurement of cotton. The CIA branch of the district police here has arrested a murder accused’s brother, who allegedly bribed a doctor to help his brother by manipulating the records of a nursing home. On the complaint of Vishal Madaan, deputy manager, Jindal Steel and Power Ltd, a case of alleged cheating in the Rs 44 crore land scam has been registered at a local city police station against six persons, including a Lt Colonel and a company representative. The Government Railway Police (GRP), Rewari, has booked Kavita Devi’s husband Rajesh, brother-in-law Narender, sister-in-law Neelam and three others, all residents of Kakodia village, 8 km from here, on the charge Kavita’s death for dowry. The opposition INLD has accused the Haryana government of gagging the Press by imposing an unofficial ban on a TV channel in the state. INLD leaders Ajay Chautala and Sampat Singh said here that the Punjab Today channel, known as “Haryana News” among the ordinary people of Haryana, had been blacked out by cable operators following pressure from the state government. The Haryana sports and youth affairs department has decided to organise gliding camps for youth at Haryana civil aviation institute, Hisar and Pinjore (Basolla), from October 23 to December 9. Monday night’s dacoities in Barwala proved to be a wake-up call for the villagers. Following the four dacoities, the villagers have decided to keep vigil in their villages by way of thikri pheras to restore the lost sense of security. 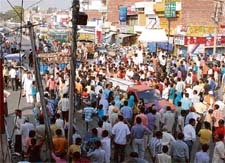 Tension gripped the township this afternoon after scores of agitated family members and supporters of Roshni Devi, the councillor who died yesterday at a superspeciality hospital in Mohali, today blocked traffic in the town for more than three hours and forcibly closed commercial establishments in the presence of district police officials. The family of Roshni Devi, councillor from ward No. 14, blamed two Karnal-based doctors for her death where she was earlier being treated for a kidney ailment. After the post-mortem at the Civil Hospital, the protesters carried her body through the markets raising slogans and later kept it in the middle of the road for hours at Committee Chowk and Hansi Road. Demanding the arrest of the doctors, the protesters ransacked the nursing home in Sector 14 here late last night. After assurance from the administration regarding appropriate action in the case, the protesters left the place. The protesters again gathered this morning at the Civil Hospital and alleged police inaction. Though the administration had deployed a heavy police force at the hospital, the protesters forcibly closed commercial establishments in the presence of the ASP, the SDM and two DSPs, who remained mute spectators. Several councillors, including the president of the local municipality, participated in the “funeral march” that forcibly closed shops at Hospital Chowk, Committee Chowk and Hansi Road for over three hours. After talks with the administration, the protesters finally performed the last rites in the evening. Meanwhile, a case has been registered against two doctors. Deputy commissioner B.S. Malik told TNS that the viscera had been sent to the PGI, Rohtak, for examination. The deceased, who was employed as an attendant, had committed suicide by consuming a poisonous substance. He had alleged that he was forced to take this step after being harassed and not allowed to join his duty by the hospital authorities, including the CMO. A case under Section 306 of the IPC and the provisions of the SC/ST Act has been registered on basis of the suicide note. The deceased identified as Ravinder (32) was a resident of the local Housing Board Colony. The suicide note stated that the deceased, who was recently transferred from a community health centre to the local Civil Hospital, was not allowed to join the duty despite several requests. It is alleged that a clerk in the hospital had demanded a bribe of Rs 5,000 and that he was abused by the officials concerned on caste basis. The kin of the deceased staged a protest outside the hospital today and said they would not take the possession of the body till the police take action against the accused. However, after the assurance of the SP and registration of the case, the kin agreed to take the body for cremation at noon. The CMO on the other hand denied the allegations and claimed that he had nothing to do with the work of joining of duty of the employee concerned and the work was connected with the office of the superintendent of the hospital. At the very onset, Advocate-General Hawa Sigh Hooda stated before a Division Bench, comprising Justice Uma Nath Singh and Justice Rajive Bhalla, that land would be acquired only for the purpose of providing public service. After hearing the Advocate-General, the Bench disposed of a bunch of petitions filed in the matter with the observation that the petitioners would be treated on a par with others whose land had been released under a notification issued in 2002. The issue was brought to the fore in 1997 after a single-judge Bench of the High Court “accepted a writ petition” challenging land acquisition in Kurukshetra district. Among other things, the petitioner, Dr A.K. Gupta, had claimed in it that he was being discriminated against as land of persons, or firms, similarly situated, had been released from acquisition. This included land belonging to the then Haryana assembly speaker H.S. Chatha. Subsequently, a bunch of petitions were filed in the High Court challenging the acquisition of “the same land” for the development of Sectors 6 and 11 at Kurukshetra. In one of the petitions against the State of Haryana and another respondent, Pawan Kumar and 30 others of Thanesar tehsil in Kurukshetra district had sought quashing of the notifications under Sections 4 and 6 of the Land Acquisition Act. Claiming to be landowners, they had added that earlier also the same land had been acquired, but the acquisition was quashed on the grounds of discrimination. Taking up the matter, the Bench, on the last date of hearing, had expressed dissatisfaction with an affidavit submitted by the State of Haryana. The Bench had ruled that the affidavit did not address the query put to the state counsel regarding the basis on which land of a particular influential politician was released, along with chunks that were the subject matter of a writ petition. Residents of Rohtak, which happens to be the hometown of Haryana Chief Minister Bhupinder Singh Hooda, have been facing an acute shortage of drinking water as well as electricity for several days. The situation grew grimmer today with power playing truant for almost the whole day. Residents of many localities in the town were forced to go without water, putting them to inconvenience. As if to compound residents’ problems, electricity remained cut off for most part of the day. Even inverters installed in houses and offices stopped working, which affected official work in particular and life in general. The functioning of educational institutions and hospitals was also affected and so was business. While the officials concerned cited technical reasons like the closure of power units for maintenance, low frequency and parameters and increased load-shedding for the situation, the hapless residents continued to suffer a nightmarish experience. Meanwhile, in an obvious move aimed at cashing in on the residents’ predicament owing to the prevailing water and power crises, the state unit of the BJP organised a “bijli dhoondho” rally here today. The rally, which was addressed by Haryana BJP deputy in charge Harjit Grewal and the general secretary, Capt Abhimanyu, proved to be a damp squib. BJP leader Vijay Goel, who was slated to address the rally, failed to turn up. The rally was marked by low attendance and was unable to send any message to the people. The speakers lashed out at the Congress government in the state for its “failure” on the power front. They alleged that the state government had not been able to produce any additional power or arrange it for the residents. Chief Minister Hooda had been unsuccessful in meeting even the basic needs of the people like water and electricity, they added. Neha Sethi, a housewife, was found dead at her house at Belvedere Park in DLF City by her husband Virender Sethi. The husband works as an assistant manager in a multinational bank at Gurgaon. The police said Virender found the body hanging from the fan after breaking open the door when he returned home from his office. Neha’s family members who rushed to Gurgaon from Jammu today after learning about her suicide said the two had tied the knot six months earlier. They added that it was an arranged marriage. The police has recovered a suicide note from Neha’s room, in which she had alleged that her husband and in-laws tortured her so much that she no more wanted to live. ACP, DLF, Sumit Kuhar said they had registered a case of dowry death against the husband and in-laws and the matter was further being investigated. Virender was arrested last night. He added that Neha had also alleged that she was compelled to abort her pregnancy by her in-laws. Police sources said earlier this week Virender’s parents were in Gurgaon. Neha’s brother Amit Gupta told the police that she was harassed for dowry. Her family members also alleged that Sethi’s demanded Rs 15 lakh for buying furniture and land. They added that they had given Rs 2 lakh to Virender few days ago. Significantly, when the deceased’s family reached the police station, they were enraged to see the accused sitting inside the police station and demanded immediate action against him. ACP Kuhar said there was no question of police giving any relief to the accused since he was already arrested. He added that actions would also be initiated against the remaining accused in the case. The forum has also directed the dealer to refund the cost of the weedicide, Rs 6,000, to the farmer. According to information, Chander Bhan, a farmer of Guhna village, filed a complaint in the consumer forum alleging that he had purchased 10 packets of weedicide from Bala Jee Fertiliser in 2004. However, despite the weedicide spray, Bhan suffered loss as a result of weed growth. He informed the dealer, who did not care for his complaint. When the company and its local dealer failed to compensate the farmer, he filed a complaint before the forum. The body of Sandeep Yadav, who died in an encounter with militants in Kupwara sector of Jammu and Kashmir in the early hours on Tuesday, was flown from Jammu to Delhi from where it was brought by an Army contingent to Dahina this morning. Sandeep was the only child of Virender Singh Yadav. However, they said the damages were minimal this time and they had been earning more with the adoption of Bt cotton. But a proper mealybugs control management was required to prevent its spread in the area, they opined. Besides, because of high price of the Bt cotton, the farmers are going for other cottonseeds, which are substandard and available at cheaper rates. Better yields, reduction in pesticide sprays against bollworms and higher profits are the biggest benefits of Bollgard (Bt cotton) in India. A visit to parts of cotton-growing villages of the district surfaced that the mealybugs had spread in many parts of the villages and pose a threat to farmers. “Although the spread of insect is not significant, the recent attack of mealybugs has worried us. With the use of Bt cotton, the yield is much more than the conventional cottonseeds. I have been growing cotton in 150 acres for the past two years and the profit has increased considerably. But farmers involved in cotton farming at a large scale suffer more than the marginal farmers with the attack of insect,” said Jagdish Chand of Panjuana village. Krishan Chand and Balbir Singh of Bansudhar village benefited by the adoption of the Bt cotton. The duo said they were reeling under debt three years ago. But things changed for them in the past two years due to bumper cotton yield and they cleared their debts as profit had increased by Rs 15,000 per acre. “With the adoption of Bollgard technology (Bt cotton), farmers engaged in the cotton cultivation in Haryana had earned Rs 43 crore as additional income in 2006. We conducted a survey in the northern region to check the spread of mealybugs. The farmers control the insect with the help of pesticides. Mealybugs had spread in small portion of land,” said Christopher Samuel, senior manager, public affair of Monsanto Holdings Private Limited (MHPL). He along with his team of experts had organised field visits and interactions with the farmers. They were agitated that despite the fact they were waiting since morning but no one turned out for the procurement. The ADC and the ASP assured the farmers of making arrangement for the procurement. It is learnt that market committee enforcement wing officials had fined three cotton factory owners on account of the irregularities committed by them in paying required fees yesterday. As a result, the factory owners restrained themselves from making any purchase of the cotton in protest. The accused was produced in a local court and sent on a three-day police remand for further investigations. Giving details of the case, a police spokesperson today said the police had registered an FIR on July 1 on the statement of Bir Bhan, a resident of Kheri Rai Wali village of this district. Bir Bhan had alleged that his brother Pala Ram died as result of injuries inflicted on him by some persons. During the investigations, the police had arrested Randhir, Sohan Lal, Mehar Singh, Shanti Bhushan and Vijay Pal. One of the accused, Shanti Bhushan, produced a medical certificate in which he was shown as admitted in Soni Hospital, GT road, Doraha, Punjab, from June 30 to July 2 due to head injuries. During further investigations, the police scrutinised the records of the hospital and found that the records were manipulated. A special medical examination of Bhushan at the Civil Hospital, Kaithal, revealed that he had no old or fresh injury mark on his head. On interrogation by the police, the accused confessed that he neither suffered any injury nor he was admitted in the hospital. On August 21, the police had arrested Dr V.P. Soni and after inquiry, it came to light that the brother of the accused, Bharat Bhushan, had tried to save him by paying Rs 30,000 to Dr Soni, who allegedly manipulated the hospital records. Following this revelation, the police arrested Bharat, a resident of Ludhiana, and booked him under Sections 302, 34, 420, 467, 468, 471 and 120-B of the IPC, the spokesperson added. According to information, with the aim to enter in real estate business, the company got a firm registered in the name of Duce Properties and Services Ltd.
Rakesh Goyal was deputed to buy land in Rathdhana village for the new company. Madaan alleged that Rakesh Goyal contacted Lt Colonel Sunil Sharma and his wife Rekha, residents of the Church Road in New Delhi, Mukesh Sharma of Khampur and Anurag Hans and Sandeep of Rajouri Garden in Delhi and bought land worth Rs 44 crore. The land, which was purchased after drawing amount from the company accounts, was allegedly in some other names. Another case of similar nature was registered on September 25 against Rakesh Goyal, Mukesh Sharma and Anurag Hans in the city police station for allegedly drawing Rs 8 crore from the company for registration of land in the company’s name. However, the alleged accused got this land also registered in some other names. The city police said the case was being investigated on the basis of documents and statements and no arrest had been made so far. Kavita’s (25) body was recovered from the Rewari-Delhi rail line, near Kumbhawas station, 6 km from here, by the GRP on Monday. A case of dowry death under Sections 498-A and 304-B of the IPC has been registered against them following a complaint lodged by Kirpa Ram, grandfather of the deceased and a resident of Shahabad town of Alwar district of Rajasthan. The complainant alleged that his granddaughter, who was married to Rajesh in 2004, was treated cruelly by her in-laws for not getting dowry. The opposition INLD has accused the Haryana government of gagging the Press by imposing an unofficial ban on a TV channel in the state. INLD leaders Ajay Chautala and Sampat Singh said here that the Punjab Today channel, known as “Haryana News” among the ordinary people of Haryana, had been blacked out by cable operators following pressure from the state government. Sampat Singh alleged that nine SHOs had been suspended by the government for failing to impose the ban in the areas under their jurisdiction. Ajay Chautala and Sampat Singh also alleged that the announcements made by Haryana Chief Minister Bhupinder Singh Hooda recently at a rally at Jhajjar were nothing but “old wine in a new bottle”. The promise of giving free residential plots to Dalits and weaker sections, which came from Hooda at Jhajjar, was being made by the Congress party right from the Nehru era, they said. The announcement on giving royalty to people whose land would be acquired by the HSIDC or HUDA was also first made by Hooda at Gohana two months ago, they said, and added that at Jhajjar the Chief Minister simply announced enhancement of the amount by Rs 5,000 to be given as royalty. The INLD also criticised the government for following a “pick-and-choose” policy with regard to giving employment to sportspersons. They said the government should have a uniform policy for rewarding sportspersons. Ajay Chautala said while Hooda rewarded a kabaddi player of his constituency by giving a cash prize of Rs 10 lakh, members of the same kabaddi team from Bhiwani were ignored. Sampat Singh said the Hooda-government was making a lot of tall claims on the power front without accomplishing much in reality. He said except for the Yamunanagar thermal plant which, he claimed, was initiated by Om Prakash Chautala, the Hooda government was most unlikely to make any further addition to power generation in the state. Ajay Chautala and Sampat Singh said the house committee set up by the Speaker on the Yamuna accord was a political move. Sampat Singh said many members of the present cabinet were ministers in 1984 also when the accord was signed. He said instead of holding the then Chief Minister Bhajan Lal responsible for the accord, the committee should probe how the cabinet gave its consent to the accord. While stating this here today, a spokesman of the department said that for the youth of Gurgaon, Rohtak and Hisar divisions, the camps would be organised at civil aviation institute, Hisar, and for the youth of Ambala division at Pinjore. As many as 40 boys and 40 girls from each division and eight boys and eight girls from each district would participate in the camps. The camps would be held for five days for each division. “We held a meeting with the sarpanches of the area and urged them to join hands with us to ensure that such incidents are not repeated. Earlier, our repeated appeals for thikri pheras had fallen on deaf ears. This has driven home the necessity of community participation in keeping crime at bay,” says ASP Maneesh Chaudhary, looking into the Barwala incidents of dacoity. The evening after the crime, in which dacoits looted four houses and left 11 injured, deputy commissioner Rajinder Kataria had issued orders for thikri pheras in villages. “Following the orders, we urged the villagers to take charge of their own security,” Chaudhary said. Investigations into the incidents suggest the dacoities to be the handiwork of the Dehe criminal tribe. The police has contacted nearby police stations to check on the number of the criminals associated with the tribe in and outside jail.